Explore Learning Momma’s Children’s Books! Teddy Learns To Obey is a simple story highlighting the joy that Teddy finds in honoring God and obeying his mommy. It is designed for toddlers ages 1-2. This book is the first in the Teddy series intended to compliment Christian parenting by celebrating God-honoring behavior. Teddy Learns To Obey is written and illustrated by Learning Momma’s publisher, Holly Witmer. Now I Know My ABCs is a comprehensive and toddler-friendly ABC book! Each page of the book features a letter of the alphabet in upper and lowercase form with a colorful illustrated object to coordinate. For continued recognition of both upper and lowercase letters, the back of the book also features a full alphabet in each form. 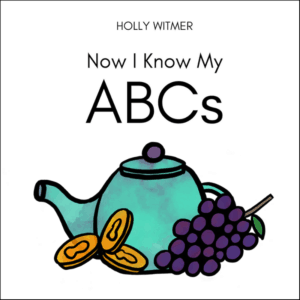 Now I Know My ABCs is written and illustrated by Learning Momma’s publisher, Holly Witmer.